So for the most part, Conquest does a good job portraying the 40k lore well. However, this only makes it especially jarring whenever the game doesn't do it justice. I had a huge problem with the Alignment system, which shows how factions can be allied and thus which deck combinations are possible. Each deck in the game contains a powerful Warlord which represents one of the factions; the deck is usually mostly full of cards from that Warlord's faction, but can also include cards from an allied faction or neutral cards. So for example, Orks can ally with the Astra Militarum. Alignment Wheel. Every faction can ally with another one that is next to it. Yeah, read that sentence again. Orks can ally with the Astra Militarum. That is pretty much unimaginable in the 40k universe from either side - the Orks seem to exist only to fight, and it's hard to conceive of a Waagh! army consciously choosing to work with another race. It's much more likely that the Orks would use the dismembered body parts of their "allies" to decorate their shootas. And if an army of Imperial Guard chose to ally with one of humankind's oldest enemies, that would definitely raise some eyebrows (and exterminatus orders) among their superiors back on Terra. The other alignments I find troubling are the Tau-Space Marine and Eldar-Dark Eldar pairings, which again just don't make much sense in the canon. I seem to remember that the Space Marines had just fought a bloody Damocles Crusade against the Tau. Likewise, the hyper-disciplined Eldar are completely at odds with the Dark Eldar, who love to raid helpless planets and capture/torture slaves. Dark Eldar event - Raid. They do it pretty often. So why do such ridiculous pairings exist? It must be primarily in service to the deckbuilding aspect of the game. If every deck was made up only of one faction and some Neutrals, that would be much more boring and give less customization options to players. You wouldn't be able to, for example, play a Dark Eldar/Chaos deck (which also works lore-wise sometimes, but is still somewhat strange) that focuses on effectively using the Area Effect damage cards available to both factions. That type of deck would be much less powerful if Dark Eldar- or Chaos-only decks were permitted. Whatever the reason, it's interesting that FFG and Eric Lang thought the Alignment system was the way to go. Other Warhammer games in the past used different alliance systems to keep things fresh: the MMO Warhammer Online: Age of Reckoning generally split the factions into "Armies of Order" and "Armies of Darkness", and a similar strategy was employed by Dawn of War: Winter Assault, which separated the factions into "Forces of Order" and "Forces of Disorder". 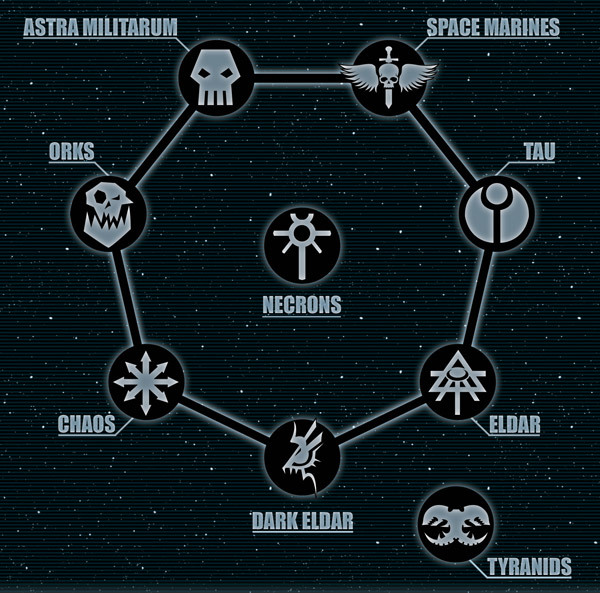 It would be interesting to see Conquest have that binary faction separation, with Eldar/Astra Militarum/Space Marines/Tau on one side and everyone else on the other. 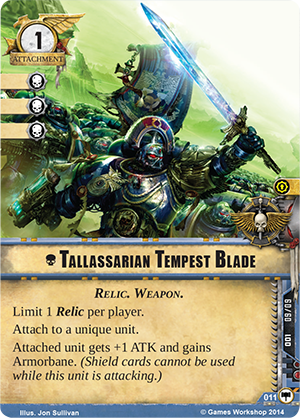 The result, while clumsier compared to the Alignment Wheel, would have more customization options (Eldar cards could be used with Space Marine cards, for example), and at least be more consistent with past canon. Another possible option would be to simply do away with Alignments and allow players to put any cards from any faction into any deck. This solution allows the most customization - we would no longer have a situation where we see a Chaos card and think 'Wow, this would go great with my Tau deck...too bad they're not aligned' - but is obviously messier and totally destroys the lore. But to be honest, I'd rather see a total disregard for this aspect of the game rather than have a world in which Dark Eldar and Eldar are totally fine with working together to conquer planets. 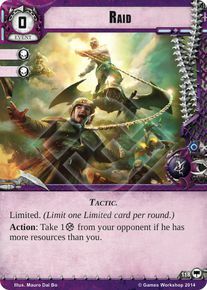 Bottom line, I think Conquest is very well done and has a nice mix of strategy, deckbuilding, and tactics, with interesting systems in each. Still, it could have been improved with regards to the Alignment Wheel, which will both distress lore lovers and limit deck assembly. Otherwise, it's a game worth playing and buying.